I enjoy most VeggieTales videos. I love the talking vegetables, the jokes that probably go over kids' heads, and the silly song that appear in each episode. 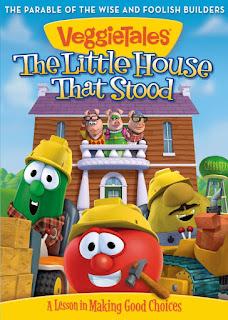 I was excited when I received an offer to review VeggieTales: The Little House that Stood and this was a DVD that I enjoyed as much as the others. The video starts out with Bob and Larry wanting to do different sketches. Larry wants to do a fairy tale story, and Bob wants to do a parable from the Bible, so they compromise and Bob becomes a builder of houses. The parable of the wise man building his house upon the rock is explained in this episode. 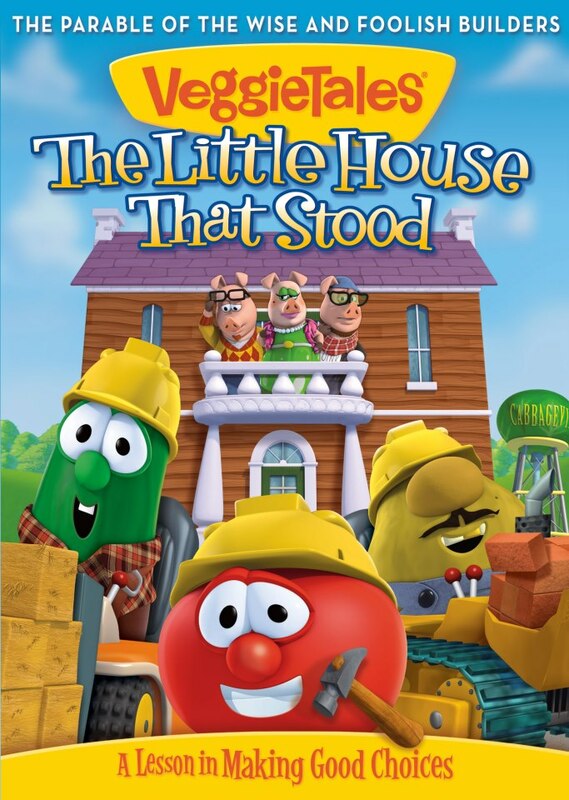 As usual, VeggieTales takes liberties with the story to make it amusing, and in this episode the Three Little Pigs come to town and each hires a different builder. One builds with brick, one with hay, and one with sticks. Cabbageville gets hit with a horrible flood, and many structures are wiped away, but there are some buildings that stand. Each one of those has something in common. It was built by Bob, and each one had a solid fountation before construction began. The silly song in this episode was not my favorite, but it was cute. It was "Happy Tooth Day". In this, Larry the Cucumber sings about his solitary tooth, including showing a baby picture of when he got his tooth. He's afraid it might be lonely, so he buys it some friends. The final section of the video was my least favorite. Bob the Tomato stars as Humpty Dumpty, mayor of Gooseville. It included lots of nursery rhyme references, but I felt it didn't have any real point to it. I suppose it was to be about helping your neighbor, but it didn't come across as very biblical. Just as a lesson, and the constant whining to Bob as mayor was a more than just a little annoying, especially the shrieks of Little Bo Peep. Everyone went directly to Bob the Tomato with their problems, not trying to help one another or seeking help of someone at church or praying about them. Still, this section was cute in its own way. As an adult who loves VeggieTales, this segment is one I would be content to never watch again, although youngsters may feel differently. Overall, this was another strong, solid episode of VeggieTales and one I would recommend. I have one copy of VeggieTales: The Little House that Stood to give to one of my readers. To enter, you must be 18 or older, and live in the USA. 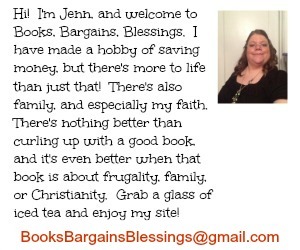 Ends March 12, 2013, and the winner will have 24 hours to respond to the e-mail or another winner will be chosen. I learned that Larry builds with hay. I also saw the silly songs. I like the silly songs we can sing along to. Pages to color can be printed at the site! They have a parent discussion guide, which I think is pretty neat. I learned you find how Humpty Dumpty got cracked!